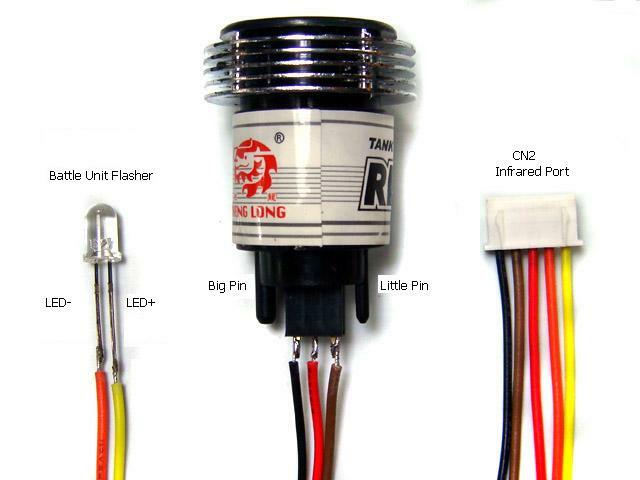 Turn your RC tank into IR battler with proportional radio control and realistic movement and sound. *Horizontal turret stabilizer has motor gain control function which allows user to fine tune performance in different motor and voltage configuration. 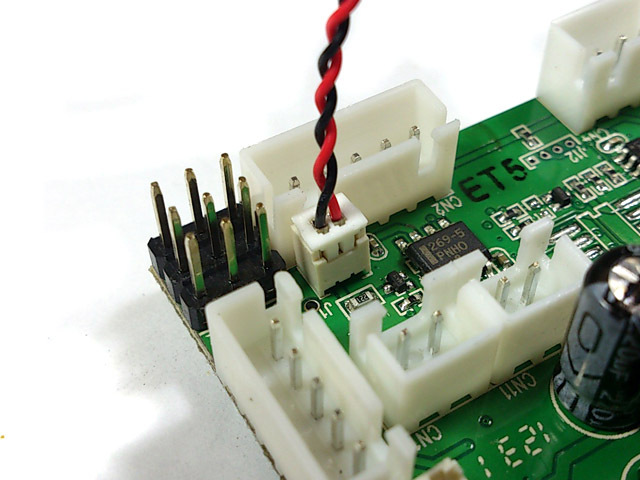 - Ultrasonic and High resolution (64 Steps) ESC driver. - V2 mixer, turning is achieved by reducing track speed and also increase opposite track speed to achieve smoother turning. Connect CH1~CH8 channel cables to receiver according to control mode. 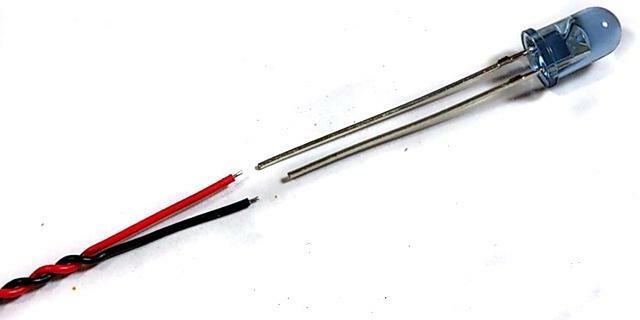 Plug Left and Right track motor to CN6 and CN7 on TK80, or solder motor wire to CN6-A, CN6-B, CN7-A and CN7-B if track motor is 540/550. 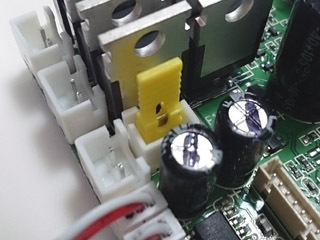 Install a switch (for example, HL Smoke Unit Switch Cable) to SW connector( Switch Cable Port) as power switch. 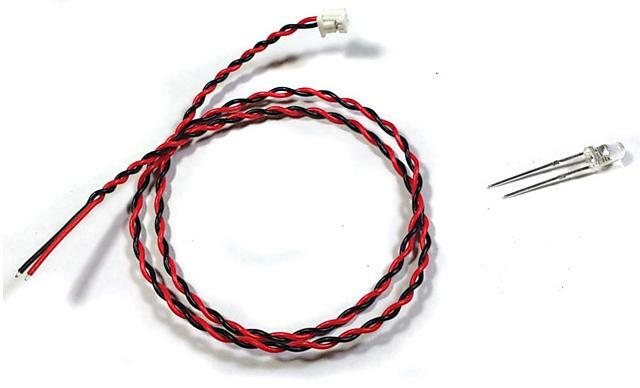 HL tank already have power switch on battery cable path, so additional switch is not required, to use a jumper to short pins in SW Cable port or connect a switch cable and keep it switched on. 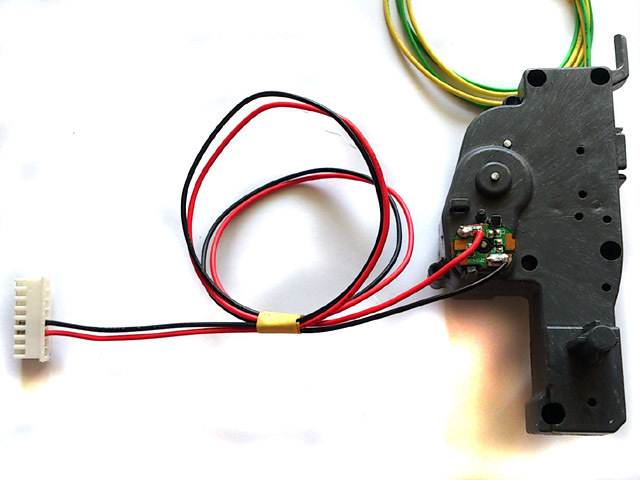 When high current track motors are used, such as 400/480 motor, power switch on battery cable path will not be able to handle, connect a switch cable (for example, HL Smoke Unit Switch Cable) to this port as power switch. Send different commands( see control mode diagram) to test each function, if board not functions accordingly, adjust trimmer on transmitter. 4. Go to end points page, set end point to 100% for every channel. 1. Plug connector with S.BUS label on it into S.BUS port on receiver. 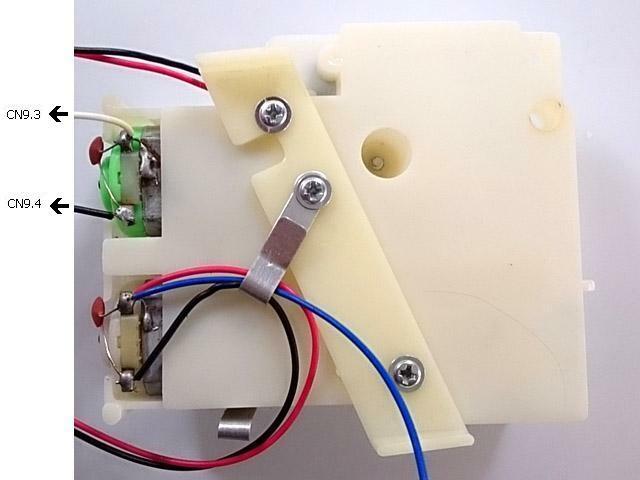 In HL original design, gun Elevation and AirSoft sharing same driving H/W, so the gun elevation can only be controlled in one direction, if you missed the angle you want, you will need to wait a full cycle of gun elevation, to correct this problem, we add dedicate AirSoft control h/w to TK20 board. the following shows you how to correct HL tank and get two direction elevation. 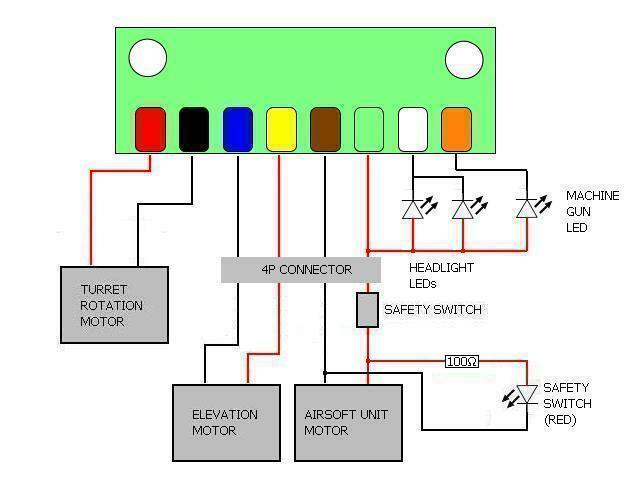 Green box in the diagram above represent the small PCB in tank, small red, black, blue ... orange in it represent the wire color. 1. 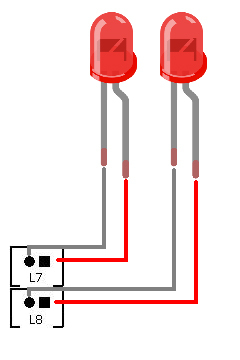 Disconnect red wire between safety switch and gun barrel elevation unit. 4. AirSoft unit is now controlled by red-black pair, gun barrel unit is controlled by red-white pair. 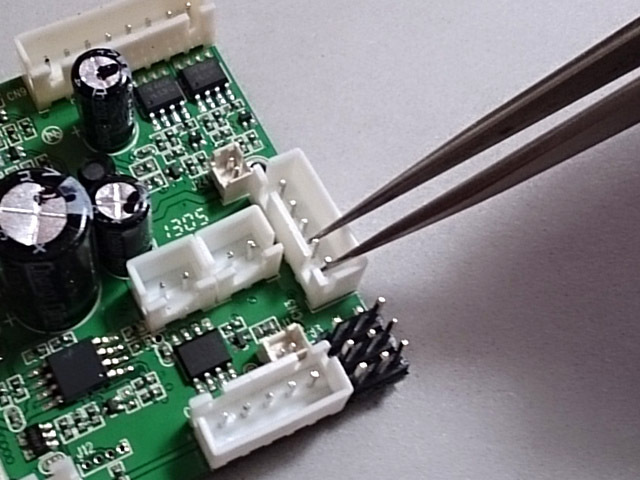 and you can connect 8P connector to CN9 on TK-18/20 with original cable. 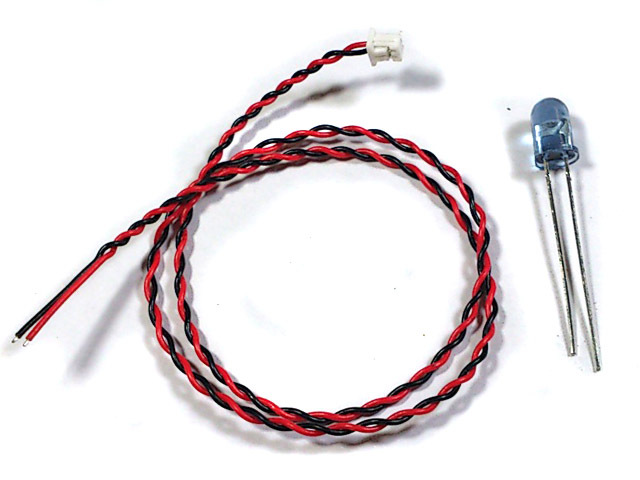 Tail Light in HL tank is wire to MG light, so the Tail Light flashes when MG firing, this is very funny to us, to correct this problem and make tail light to be controlled with Headlight, please refer to the picture below and rewire it. 3. 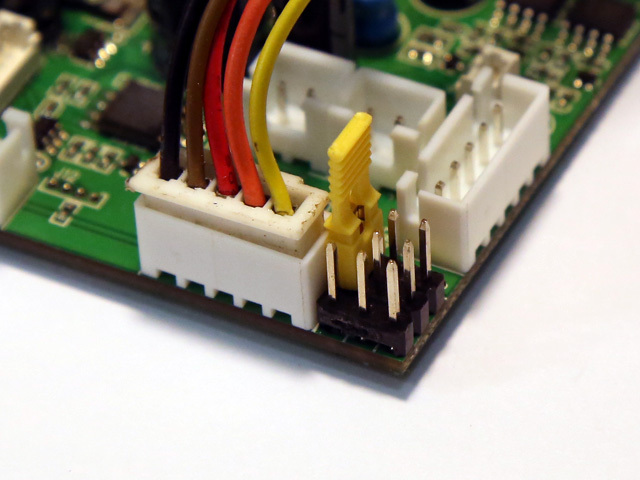 Connect a 200 Ohm resistor between 2-P connector pin and CN9.2 pin(Green), a SMD type resistor is used in this example to save space. STEP2. 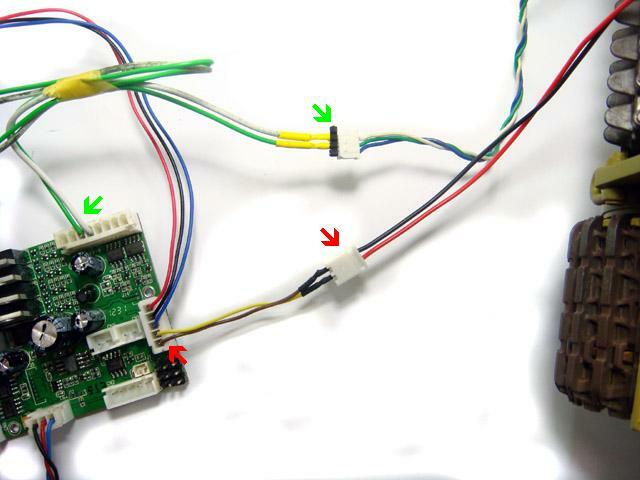 green wire and white wire in green-white-blue cable goes to 3rd pin on CN9 and 4th pin on CN9(see arrow in green), black and red wire in red-black cable goes to 4th and 5th pin on CN3(see arrow in red). STEP2. 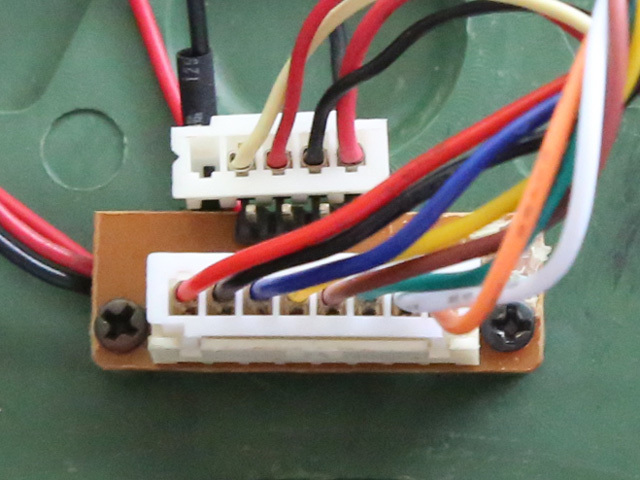 Connect detection SW( Pressed-to-Short type ) to 4th and 5th pin on CN3 or via the plug (Yellow and brown wire) from HL HIGH-TENSION FLASHER. Latest released HL recoil unit already has detection switch on it. STEP3. 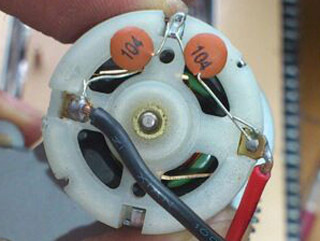 connect motor - to 4th pin on CN9.connect motor + to 3rd pin on CN9. STEP2. Connect Recoil motor + to 3rd pin on CN9.connect motor - to 4th pin on CN9. 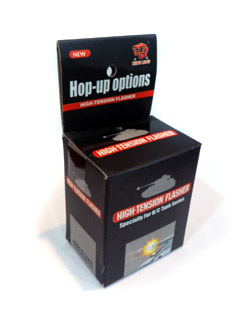 HL Hop-up options "HIGH-TENSION FLASHER" can be easily installed and works with TK80 to simulate gun nuzzle flash when firing. 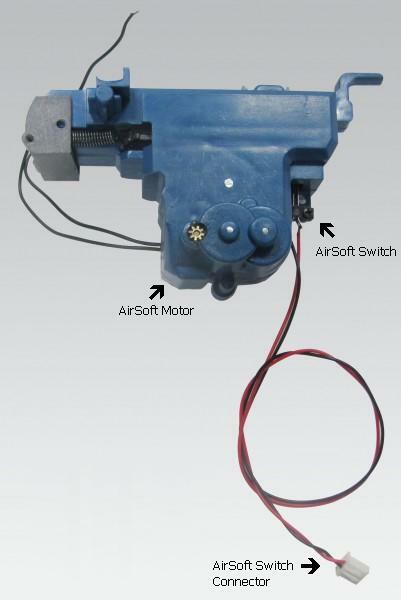 A conventional smoker include two major parts, Heater and Fan/Pump, Heater heats oil to generate smoke, and Fan/Pump pushes smoke from smoker unit, on a stock HL Smoker, heater and pump motor are wired together and driven together as shown in the picture below. 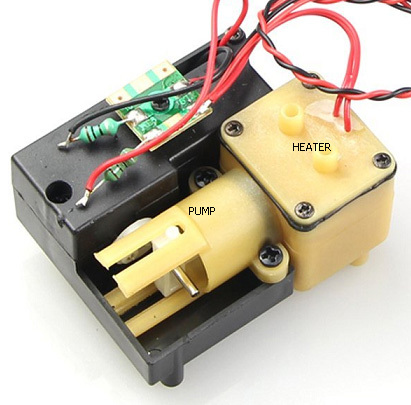 TK80 is capable to control Fan/Pump and Heater separately to achieve more realistic smoke effect, it starts to heat heater to generate smoke right after engine start command is given and smoke accumulated in the chamber, at the moment of engine start, it drive pump/Fan at full speed to create burst of smoke like real engine, then it drive pump/Fan proportionally according to the throttle, when engine stop command is given, it stops fan/pump and heater heating. If separate control is not needed, just connect stock Hen long Smoker to CN10, and switch to switch port CN11, TK80 will also drive HL smoker proportionally according to the throttle. 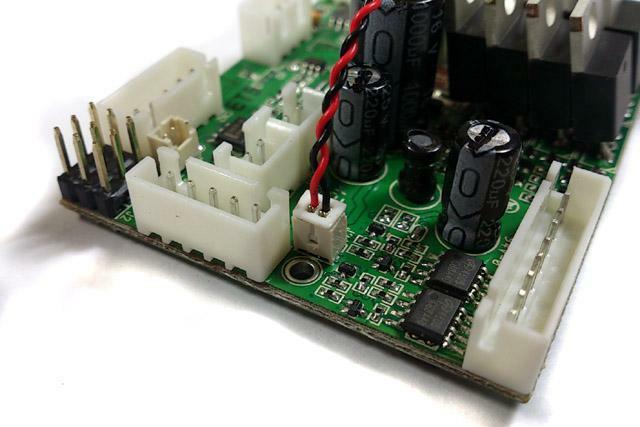 Settings of TK series board can only be changed when TK board is in programming mode, and by Configuration IR REMOTE as IR command transmitter, and TAMIYA battle unit(TBU), Heng-Leog battle unit(HBU), or our programming line as IR command receiver. STEP 6: turn power off, remove jumper on J2, then turn power on and TK board return to running mode and run with new settings. 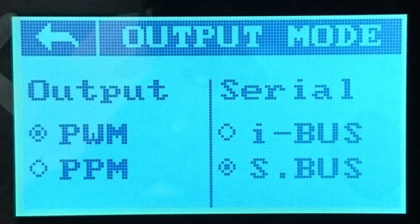 Mixer Mode: Press (MUTE) key on IR Configuration Remote to select. 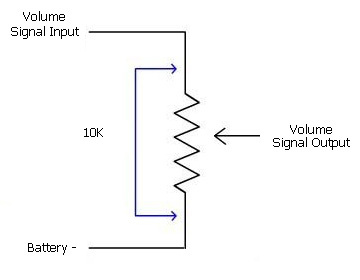 *A Power on and off cycle( turn off power for 5 seconds then power on) is needed to active change after mode change. Tank Running Start threshold : press " 7" key on IR configuration remote to select. When input throttle is larger than this setting, engine sound simulation leave idle state, enter running state. Low Battery threshold : press " 0" key on IR configuration remote to select, when detected battery voltage lower than setting, ESC output will be reduced. Software Version: press "(? )","DISPLAY" or "DRC-MF" key on IR Configuration Remote to select. 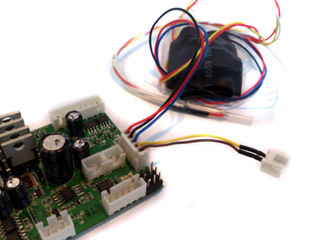 Ultrasonic ESC start voltage reset to zero: Select page 3, press "DISPLAY" or "?" Key on IR Configuration Remote to reset start voltage, indicator flash once every time. 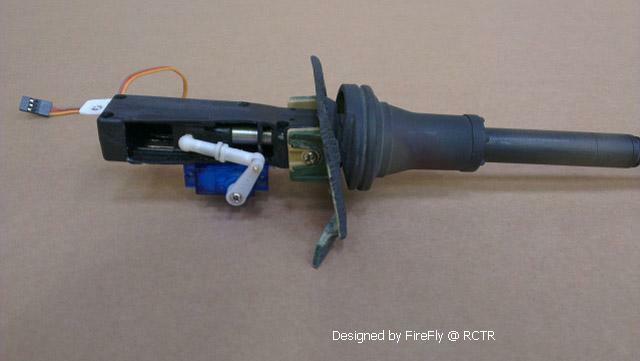 Point Configuration IR remote to TBU/HBU and press key listed below to show vehicle status or test IR battle function. No jumper should be installed on J1. Q: elevation in wrong direction, how to change? 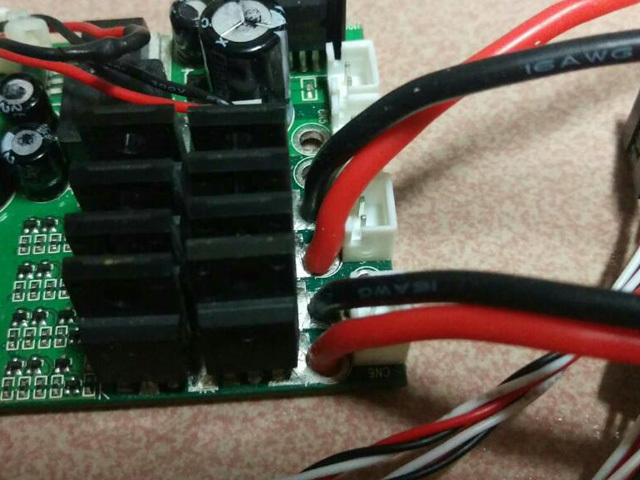 Q:How to use Motor Additional Pad to connect 540/550 motor? 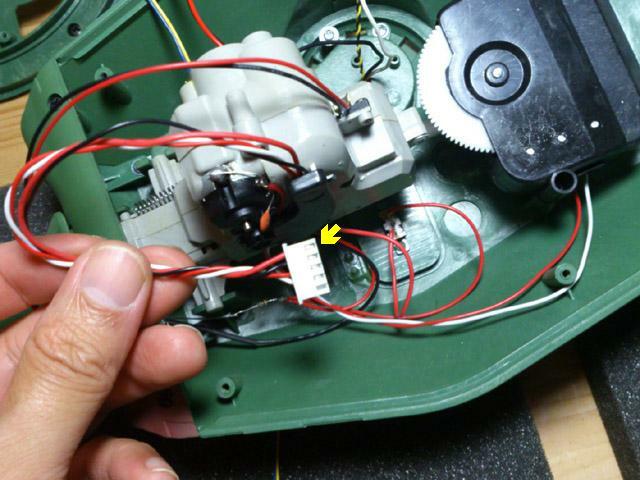 Q: My TK80 can not register a hit from Tamiya tank. A: To check "Receive Tamiya IR code" setting. TK80 won't response Tamiay IR code when this setting is disabled. 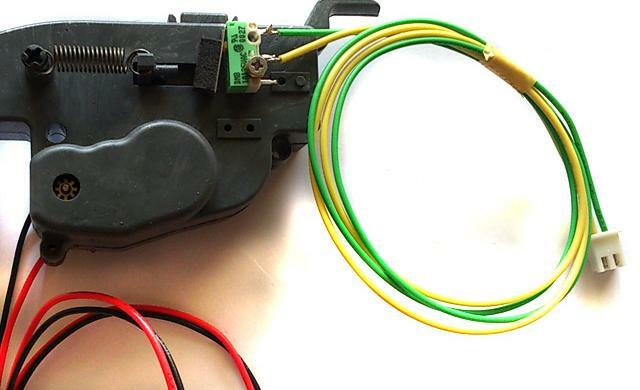 Q: The airsoft motor does not run until after the gun fire sound has played and the reload sound has happened. I want the airsoft motor to run while the gun sound plays. 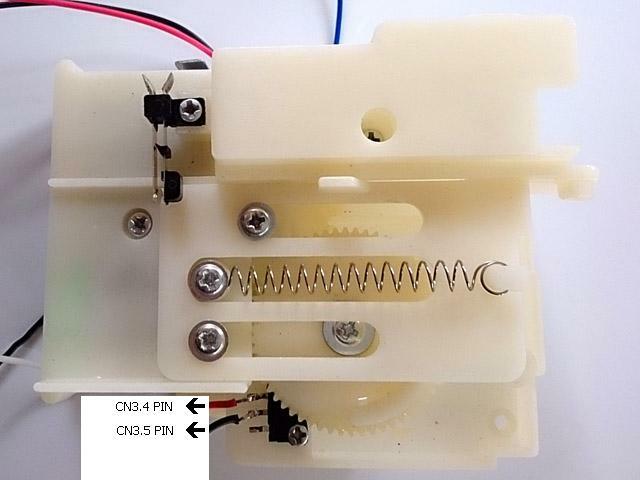 I also planned to make recoil work with the airsoft…but when I fire the gun, the recoil servo operates in time to the sound…but has returned to the normal position when the airsoft motor operates. A: Just need to set Main Gun Function Mode to AirSoft mode, then cannon sound, servo recoil and airsoft unit will be synchronized. Q: I already set Main Gun Function Mode to HL AirSoft MODE, but AirSoft motor does not run when I give fire cannon command. 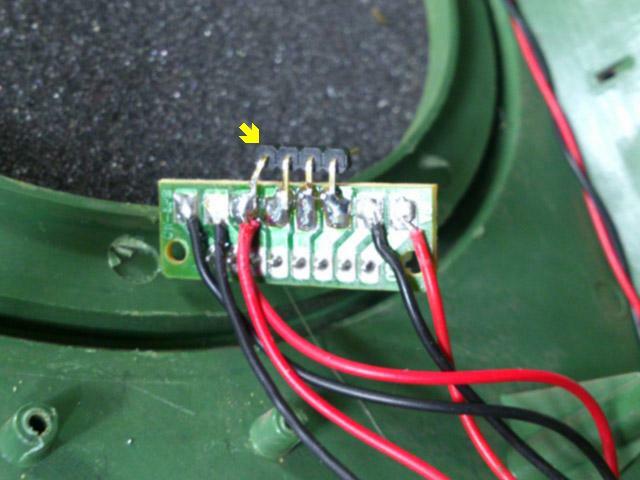 A:To correct airsoft unit wiring as HL Gun Elevation and AirSoft Correction section mentioned. 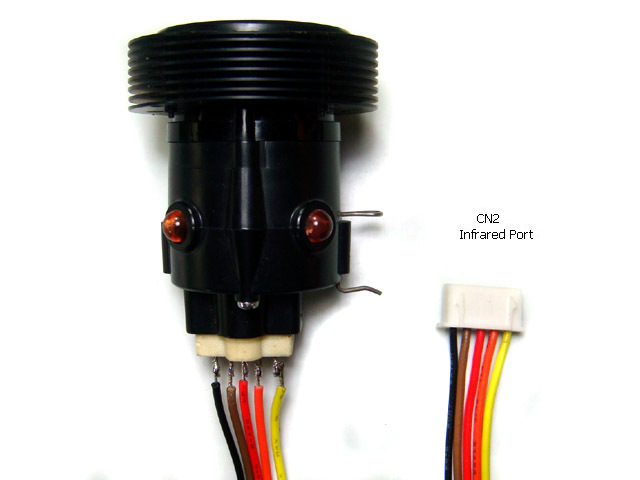 Q: Airsoft unit fires continuously and have no cannon sound. 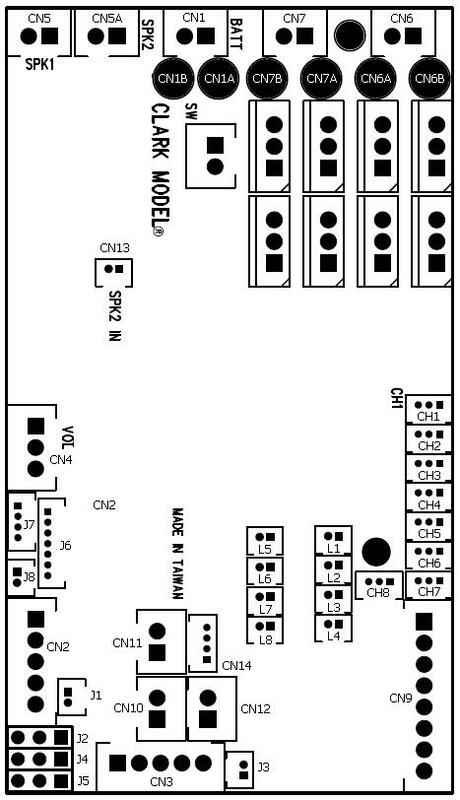 A: When main Main Gun Function Mode is configured to AirSoft Mode, TK80 start to drive AirSoft motor (thought CN9 3rd &4th pin) when fire cannon command is received. 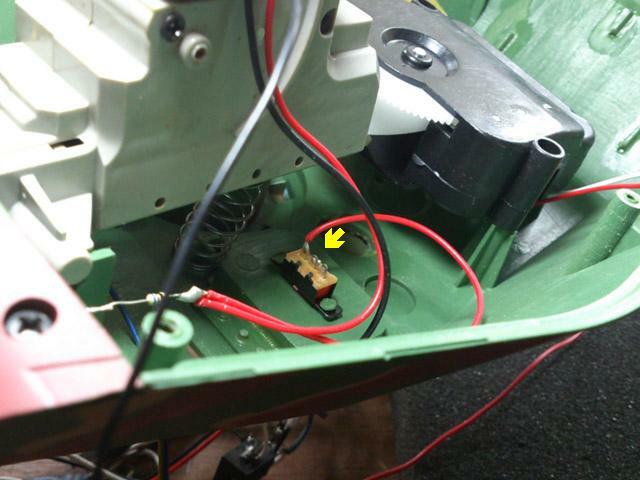 when Airsoft just fired, Airsoft switch is closed , TK80 knows it thought CN3 Pin4 & Pin5. and then stop to drive Airsoft Motor and start to generate cannon. 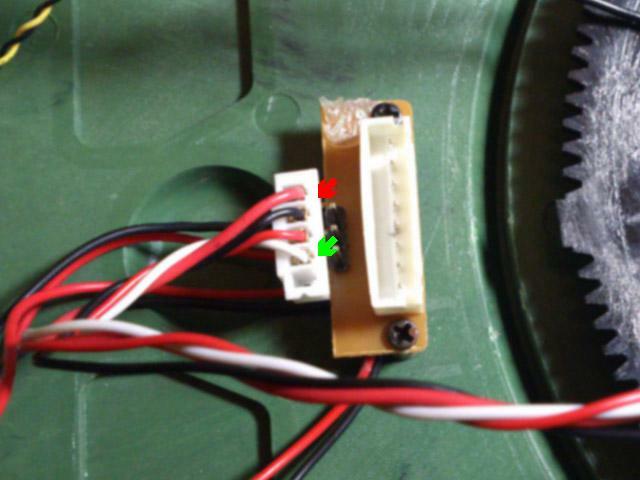 So in order to make it works properly, AirSoft motor need to be connected to CN9 pin3 and pin4. 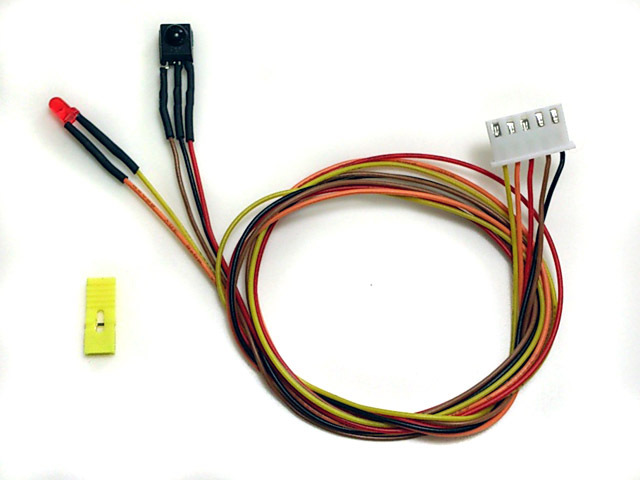 AirSoft switch connector to CN3 Pin4 & Pin5. 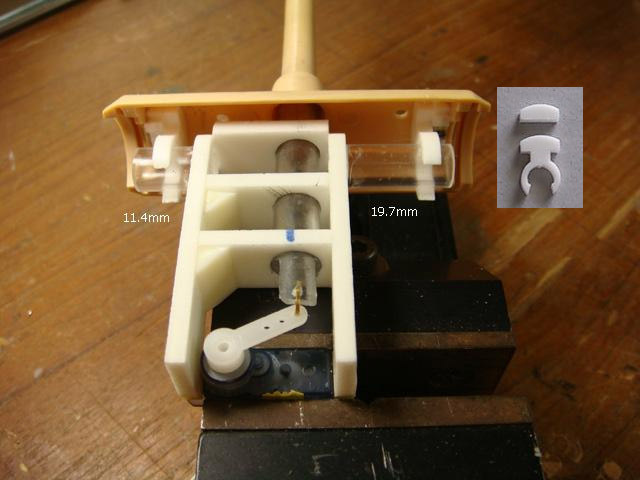 You can simply test it by a tweezers, to short and release it will stop AirSoft motor. 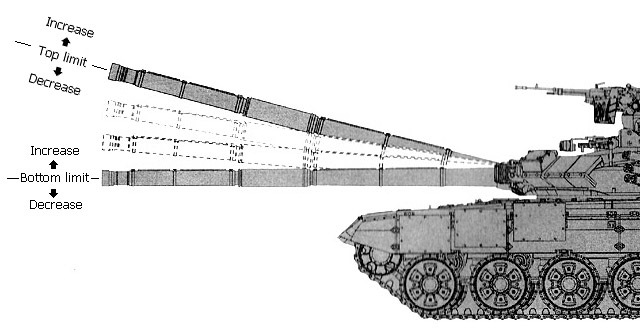 Q: Tank hull recoil movement direction is not correct, moves forward and then backward while firing main gun. A: Just need to swap motor cables, CN6 to Motor Right, CN7 to Motor Left, and turn on servo reverser function on throttle channel from radio transmitter. 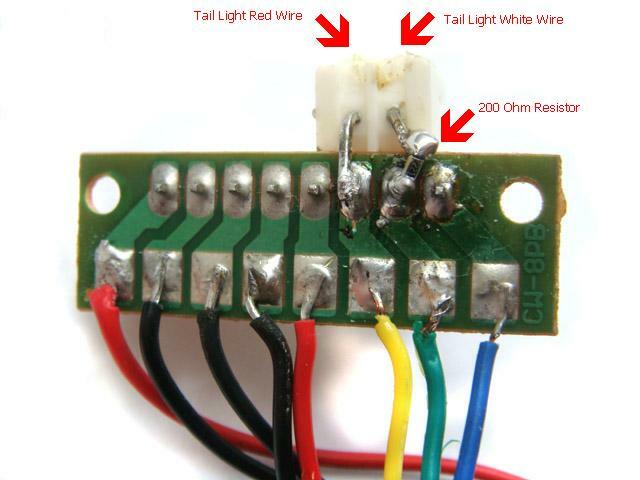 This type of capacitor is not good, DO NOT USE! Q:Tank moves backward faster than forwards and does not turn. It only turn if firstly turn steering stick and secondly throttle stick. 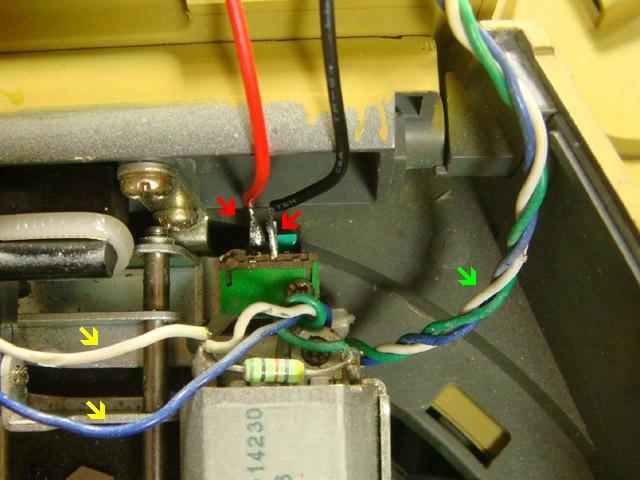 A: To turn off mixer on transmitter and test again. 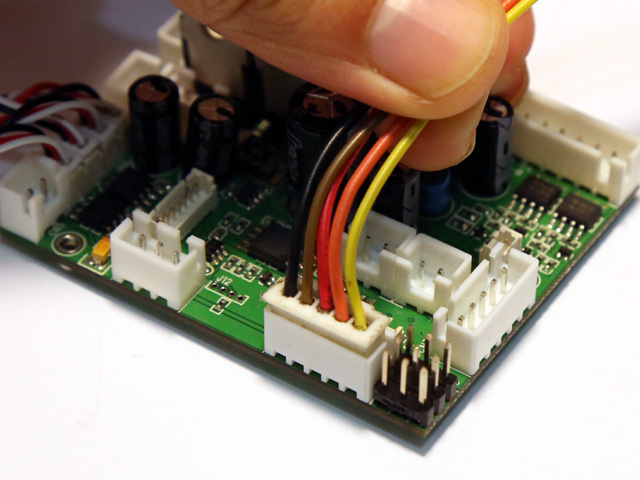 A: Check if battery voltage is too low, auto cutoff function cuts motor off when battery voltage is too low. A: A piece of software that converts Rudder and Throttle control signal to Left and Right track speed signal. 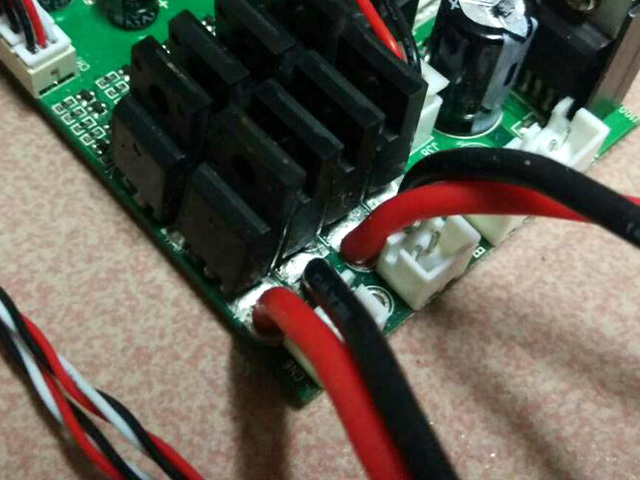 All TK board has mixer on it, mixer function on RC transmitter need to be turned off. A: Controller cuts motor off and waits signal come back. 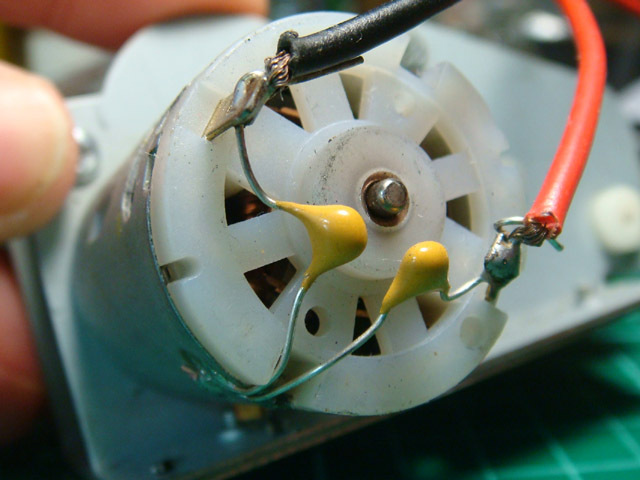 A: The motor cutoff will occurred when battery input drops below minimum supply voltage of controller. A: Basically, TK can work with all kind of aftermarket RC system as long as it's PWM system, here is a table list most popular one. 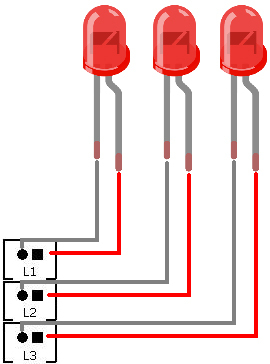 Q: Is it possible to make additional settings using existing IR signals for example to make HL IR signal and 9 hits can take, originally 5 hits? A: yes, IR code to receive, IR code to transmit, preset & battle data can be set independently. 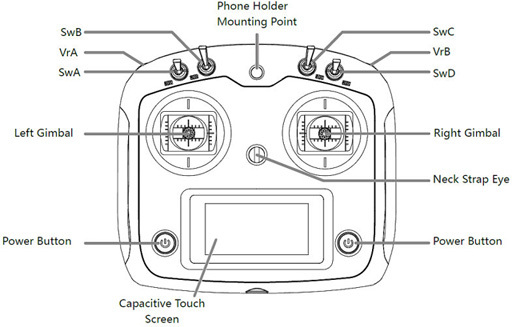 Q: Is it possible to set setting with other device (not SONY IR code remote)? A: Only Sony IR code remote can be used, you can also have universal remote and configure it to SONY mode. Q: Any Other SONY remote, such as SONY Bravia unified IR Configuration Remote, can config TK20? A: Can't sure, with more and more setting function are added, some code not common on every remote are used. so we suggest to use same remote as we use. A: BEC stands for battery elimination circuit. 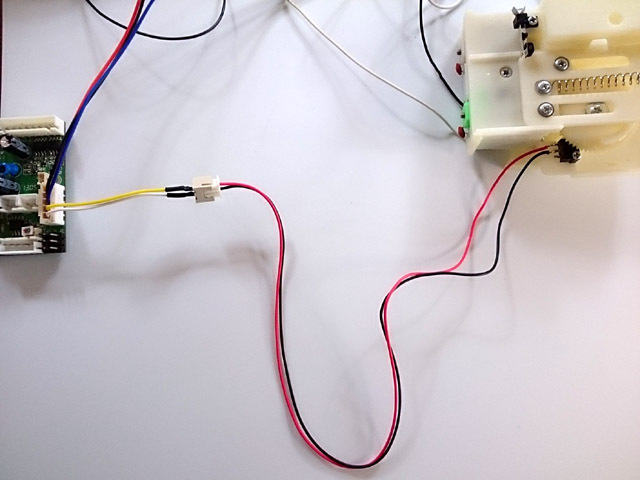 This circuit powers the receiver thought channel cable, no secondary battery source is required. 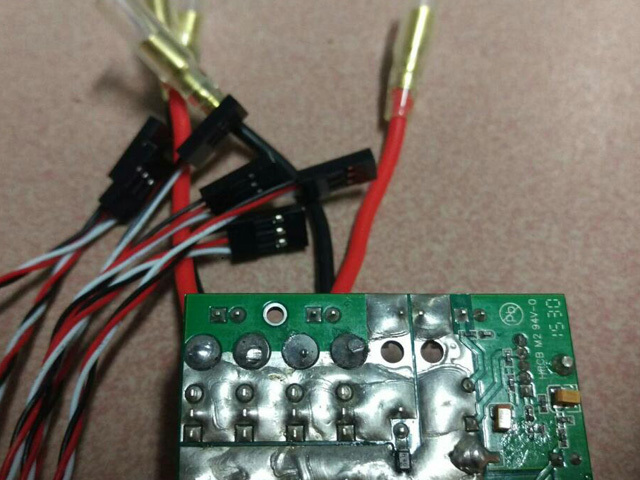 Use dry battery or power supply as power source at testing to keep burn down anything if any error on modification. then use chargeable battery when every function working normally. Read carefully and fully understand the instructions before commencing assembly. 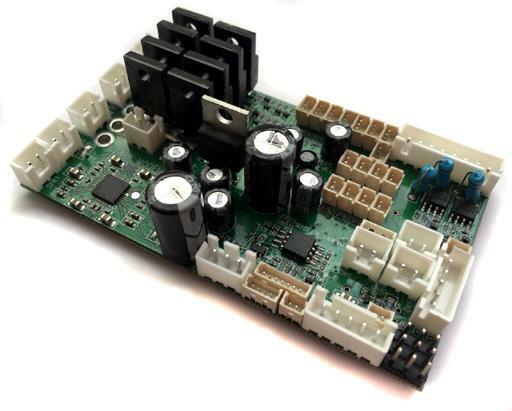 Metal part on FET can not be touched with any metal when TK board is operating.